Protect display cases and secure kiosks and counters with our compact Mini Roll Up security grilles. They are perfect for smaller doorways and reception areas. The Mini Roll Up is also a great solution for residential applications in which windows need to be protected during prolonged absences. With lots of choice in locking hardware and a fully enclosed header, the Mini Roll Up has an impressive ability to secure smaller openings. The header is designed to be almost tamper proof once installed. Whether you choose manual, crank or motorized operation, the Mini Roll Up is easy to open and close. There are many options to choose from with motorized operation, including remote controls. The Mini Roll Up is available in an incredible variety of aluminum or polycarbonate grille options, from solid to perforated and clear to opaque. Finishes include clear anodized aluminum and almost any colour of powder-coat. Our experts have been helping architects create designs faster for years. They not only answer questions about our doors, they can help you get your design done faster and help your project by verifying specifications. Material: rolled formed aluminum slat with foam core. Panel height: 2 5/16” – for full sizing details, please see brochure. Coil box size: 6”, 7”, 8”, 9”, 10”, 11”. Coil box size: 7”, 8”, 9”. 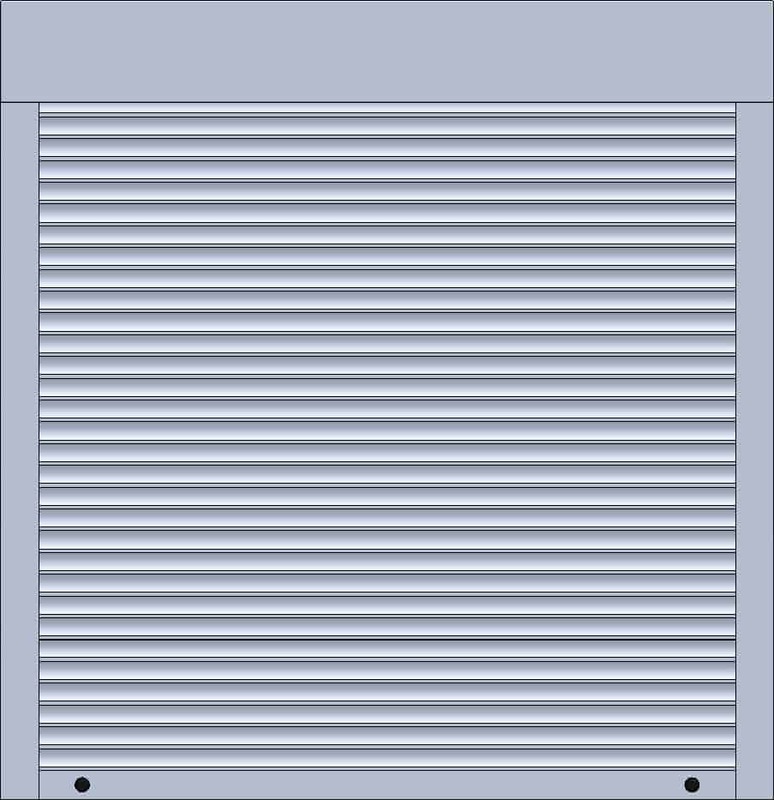 Material: Aluminum slats with a large, central vent opening. Panel height: 2 5/16” – for full sizing details, including vent size, please see brochure. Hinge: 1 piece continuous aluminum..
Material: Solid extruded aluminum panels. Coil box size: 6”, 7”, 8”, 9”, 10”. Panel height: 1 ½” – for full sizing details, please see brochure. Material: Solid extruded aluminum slats. Coil box size: 6”, 7”, 8”, 9”. Choose between no locks, slide locks, cylinder locks, 1” mortise locks with interchangeable cylinders or SFIC locks. The slide locks and cylinder lock require a standard 2” bottom bar. If you need a 1” mortise cylinder lock or a SFIC Lock, the door will require a heavy duty 3” bottom bar. The header is as small as possible without interfering with the smooth operation of the shutter. It’s perfect for smaller openings such as counter pass-through windows or in service kiosks. Mounting the the header can be either through the face of the opening or into the jamb. Opening and closing can be done with manual operation, a crank, or with electric motor. The electric motor operator can be controlled with a switch (toggle or paddle) or a key. Colour options depend on material chosen. With polycarbonate slats, perforated aluminum slats, or solid extruded aluminum slats, the only option is a clear anodized finish. With rolled formed aluminum slats with foam cores, you can choose between clear anodized, white paint, beige paint or bronze paint. The Mini Roll Up is perfect for any of these projects types or situations.